Mesmerize your loved ones with this gift of Beautiful Pink Love Teddy with Heart and make their Valentines Day very special. 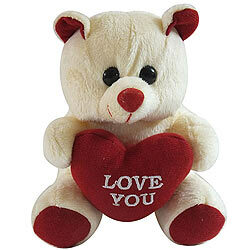 This amazing Teddy Bear holding a heart is a classic present for your loved ones on this romantic day of love. It is 10 inches in size.